Well leading on very nicely from my last post and much to my joy, Holly has given us the task of creating a mood board for our blog. I set this blog up 12 months ago and did it very quickly, tinkering along the way making changes as I learnt new things, however, I never sat down and actually thought about what personality I wanted my blog to have so this exercise has been great for me. The result, something of elegant sophistication with a touch of fun and mischief, a bit like one of my favourite style icons Audrey Hepburn. So classic and stylish but I love her cheeky mischievous side. The colours would be crisp black and white with muted greys and dusky pinks and pops of bright colours. I want it to look edible and sweet with bit of glitter and sparkle. It needs to have a modern editorial style but also be natural and friendly with a handmade touch. I will cover contemporary design styles alongside emotive photography and hand crafts such as stationery and paper goods. Typography, particularly hand lettering is a big passion of mine at the moment so that will feature heavily. I've taken inspiration from some of my favourite blogs; Besotted Brand, Breanna Rose, Blog Milk, Lobster and Swan, Elephantine, Sania Pell and of course......Pinterest! I'm really quite chuffed with the feel of this board and can't wait until I have the time to start implementing it in my blog. What do you think? Anything you'd like to add? Feminine, classic, pretty, and full of some of my favorite things so YES good choices. Now where's my bubblegum? Anna, this board is just perfect. Love the colours, use of shapes and text. Beautiful. I love this mood board! The color scheme is awesome, and I love the graphic elements. There's such a playfulness about it too. It has personality! Anna, I love your mood board. The gum chewing lady, colous and design just speak in unison. It made me smile. Thanks. Oh, great job, Anna! I really adore your moodboard! And I am a fan of pantone honeysuckle! And btw if you would please send me this awesome hat over ;-)? It's a pleasure, loving meeting all these new people and discovering new blogs. Hi Anna, I'm a fellow BYW student. I love your mood board! It seems like it reflects your personality very well. I enjoyed learning about you on your about me page. I think it's neat you dedicated your blog to your mum. I also have a love of books. I think I collect them more than I read them though. I wish I were a speed reader. Good luck with the last week or so of class. Thanks Dawn, I know what you mean about wishing you were a speed reader, I savour every word when I read! I adore your mood board! Love your style and so happy I found your blog through BYW! A wonderful mood board, sophisticated and light in feel. Suits your blog perfectly ... and makes me realise that I still have a long way to go! I just wanted to thank you so much for being the first ever person to comment on my blog! I am so glad you did as it has lead me over here. 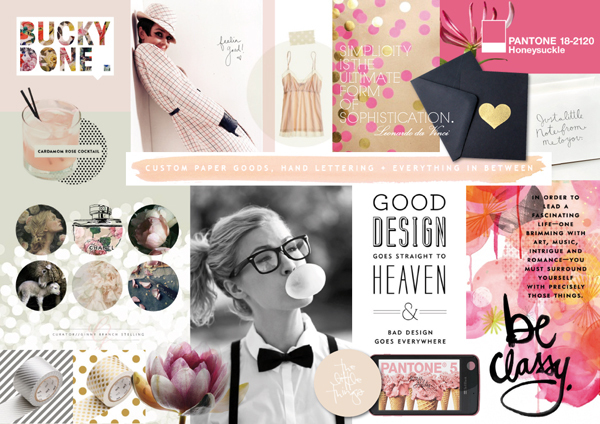 Your mood board is beautiful too as is your whole blog - so polished and cohesive. You are such an inspiration for someone like me who is just starting out. I look forward to following along. Anna - loving your moodboard and now I'm signed up too :-) When my little blog grows up, I'd love it to look like this. I could sit reading blogs and looking at Pinterest all day, if only I didnt have a day job. Hope the course is going well and look forward to meeting you next week - yay! So tasteful and inspiring mood board! And your blog full of beautiful images and so stylish!